Kamil Fırat was born in Istanbul in 1959. He opened solo exhibitions in Turkey and abroad. His photographs were included in the collections of Belgium Anvers Photography Museum and Germany Bochum Museum. He published books, namely “Atlar (Horses)”, “Kırkpınar Yağlı Güreşleri (Kırkpınar Oil Wrestling)”, “Kapadokya (Cappadocia)”, “Özne-Hilmi Yavuz (Subject-Hilmi Yavuz)”. He was among the founders of Adatepe Taşmektep. 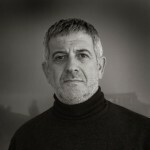 Currently he is continuing his career as a lecturer at Mimar Sinan University Fine Arts School Photography Department.